Life is complicated. And I find it fascinating that people tend to make it even more complicated by not thinking practically. One of the things that we never think about is the way we think. We waste a lot of time trying to solve problems that are not even problems. I think: Why do you even want to do everything? By wanting that, you’re fabricating a problem. From a practical point of view, you can only do a few things with your time, and that also means you can only do a few things in a lifetime. That’s practical thinking. It’s something I’ve also learned over the past decade. Most people who meet me now think I’ve always been a practical thinker. That’s not true. 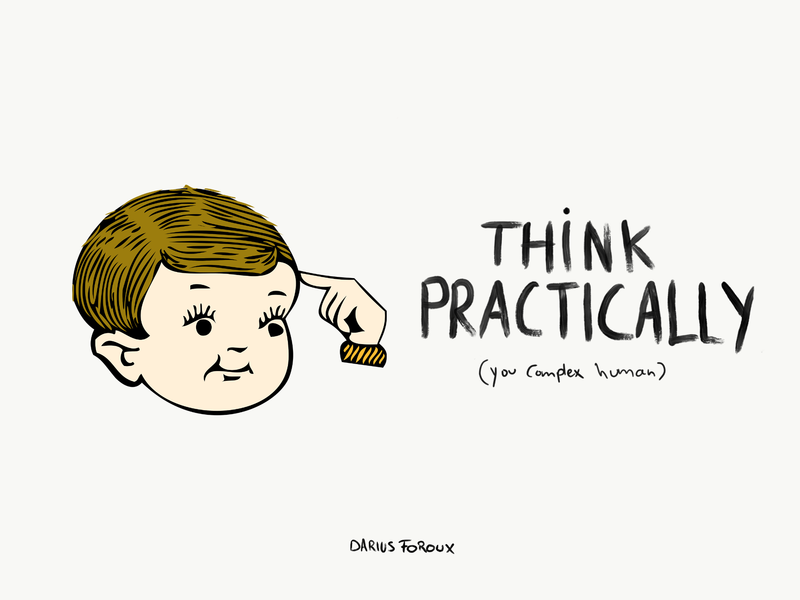 It took me years to learn practical thinking. It’s difficult to simplify complex problems. And practical thinking is a valuable skill that has helped me to solve complex problems in my life and career. It has helped me to live a better and happier life. To learn practical thinking, you don’t have to study pragmatism (a philosophical movement that started a century ago) because that’s boring. Pragmatists called themselves anti-intellectualists and they didn’t even like philosophy. They argued that most philosophers wasted their time thinking about things that have zero practical value. The idea behind pragmatism is this: If something’s logical, it doesn’t necessarily mean that it’s useful. There are a lot of truths in the world. But so what? If a piece of advice, research, theory, or idea has no practical purpose for you (personally), it’s useless. Enough about that. Let’s get down to four books that helped me to become a practical thinker. I love the title of this collection of lectures that James gave at Lowell Institute and Columbia University in the early 1900s. The man says it how he sees it. Pragmatism is not really a philosophy in the traditional sense. It’s merely a way of thinking. And it’s also nothing new. What does it contribute? Pragmatists are completely neutral. They never believe in something just because other people believe it. No, a pragmatist only believes in what is practical. In other words: What works. This collection is free, and I highly recommend reading it to everybody. The ideas of James are useful, and you can easily apply them to modern life. Unless you’re really into philosophy, I would only read this collection about pragmatism (otherwise, I also recommend John Dewey’s work). The other books on this list are not philosophy books. In my opinion, Richard Branson is the most successful entrepreneur of the 21st century. I say that because I think he’s had the biggest impact on other people’s lives. He’s not only made millions or employed thousands of people. He’s an inspiration to many entrepreneurs. Growing up, I massively looked up to Branson. Most people who are 25 and older remember his crazy stunts. He’s an interesting character. But what I admire most about the man is the way he thinks. Just read the story behind Virgin Atlantic. Branson was stuck on Puerto Rico and decided to charter a plane and sell tickets to the other people who were stuck too. And an airline was born. You can’t get more practical than that. What was that? Are you complaining about your job? Or how hard it is to take care of your family? I find it fascinating how soft we all are, especially if you compare our struggles to what Helen Keller experienced. She is one of my biggest heroes. A remarkable person who made the most out of life despite being deaf and blind since she was 19 months old. Reading her autobiography (which she wrote at the age of 22), you get a peek inside her mind. And it’s great to see how she thought about life. Most people have heard about Helen Keller, but I haven’t met a lot of people who read her autobiography. I believe that it’s worth reading about her perspective on life. Some of her critics say that she doesn’t talk a lot about her struggles and always stays very positive. But that makes it even more fascinating to me. Complaining and giving up is easy. Making the best out of what you have is hard. And without a practical mind, it’s impossible. Steve Jobs was not a practical man. Many have read about his obsession with the interior of Apple products and facilities. He was obsessed with aesthetics of things that users of Apple products would never see. Who cares about how the Apple production facility looks like? Or how the iPhone looks from the inside? Spending time and money on those things is far from practical. And yet, it all had a purpose in Job’s mind. The reason I mention this book on this list is that life is not only about practical thinking. Otherwise, we would only care about outcomes. But I think it’s also important to think about HOW you get to outcomes. Not everything I do in life is practical. Some things are a matter of style, taste, and aesthetics. In fact, Steve Jobs argued that everything is a matter of taste. He famously said that Microsoft didn’t have taste. That’s why they sucked in his opinion. I agree. In fact, most people and organizations are so boring that you can’t listen for a second to what they say. From studying Steve Jobs, I learned how you can combine practical thinking with unpractical things like taste. Because when you combine those two things, you truly have a winning combination. People without practical thinking remain starving artists. Practical people without taste remain lackluster. Life is way too short to be boring. Make it fun. Now that’s practical.